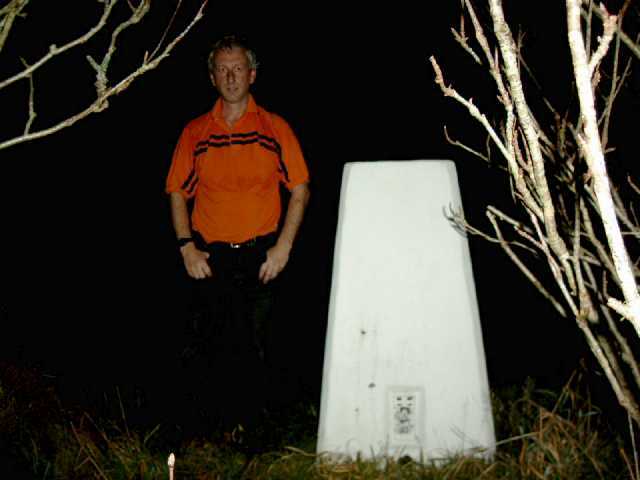 Is ranked joint 1543rd with 20 other trigs (more). A lot going on at this summit. 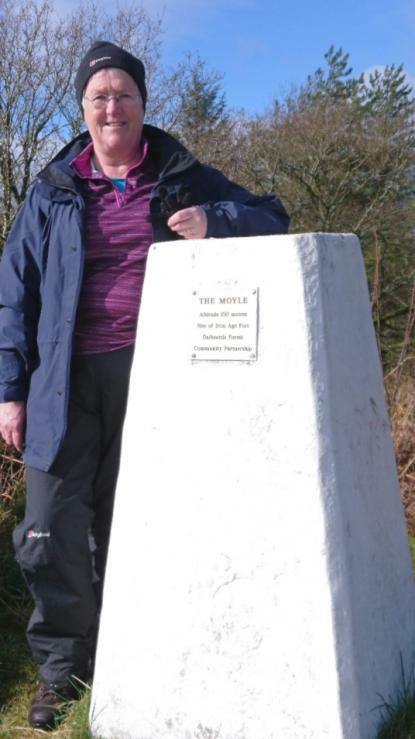 Very enjoyable walk anyhow. Parked on minor rd (NX 8431 5638). Good woodland track to NX 8471 5730 whence smaller track to the top. 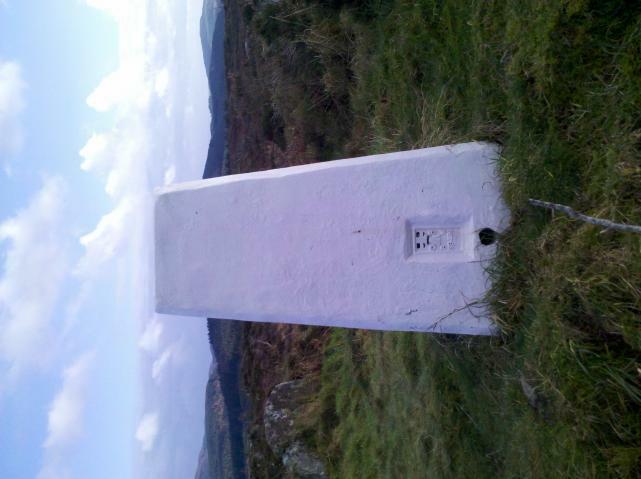 Pillar has been heavily painted, inc all metalwork, and bears a Community Partnership plaque. Top cap missing, no plug. With Alex C.
Amazing run of weather we are having! Came for a look at the Iron Age fort. Spider centre open. 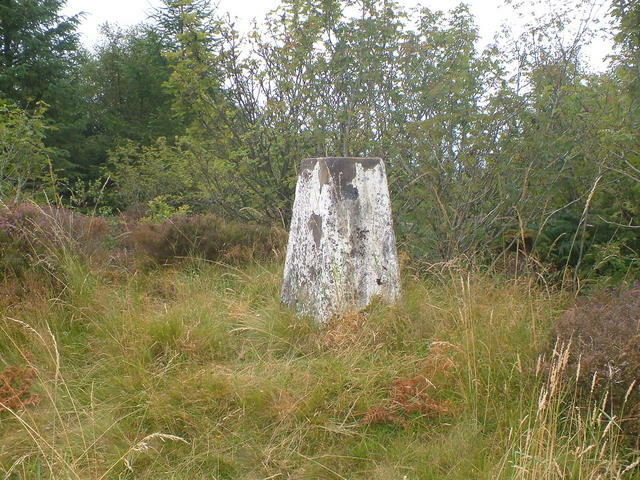 Pillar painted white. Lovely lovely lovely. Accessed from 2 different points on the MTB trails. Easiest foot access would be from Barnbarroch then follow the fireroad east as you enter the forest and I imagine Moyle Hill is signposted from here as there are signposts on the Red MTB route or follow the fireroad North and look for where the blue route joins the singletrack and go directly up the scree slope and follow the single track to the right at the top of this. Watch out for MTBers coming down the scree slope though as it's part of the Red Route. Started 7 Stanes car park. Followed track to NX 84692 58074 where the path to top starts. 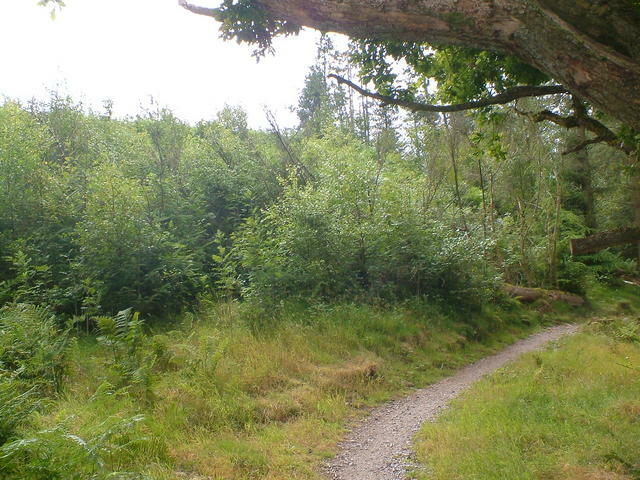 Earthworks of an old hill fort in a forest. Punishing walk up thru the dense woodland. Some mountain bike trails. Summit a little overgrown. Handy seat nearby. Good views to one side. Went up from the mountain bike track. At the summit I found a cleared path running from north to south traversing the hill. 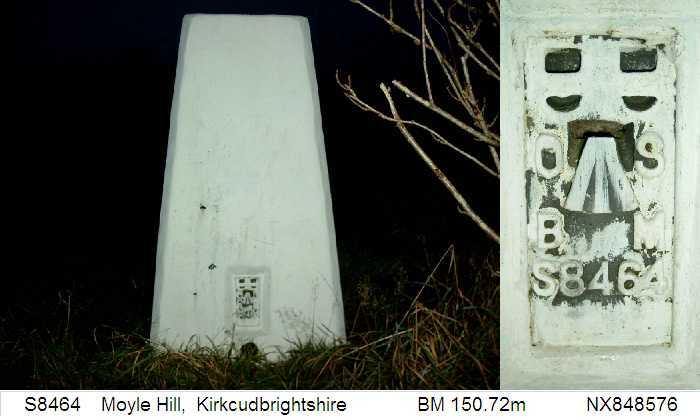 This is signposted from the col at the south of the hill. 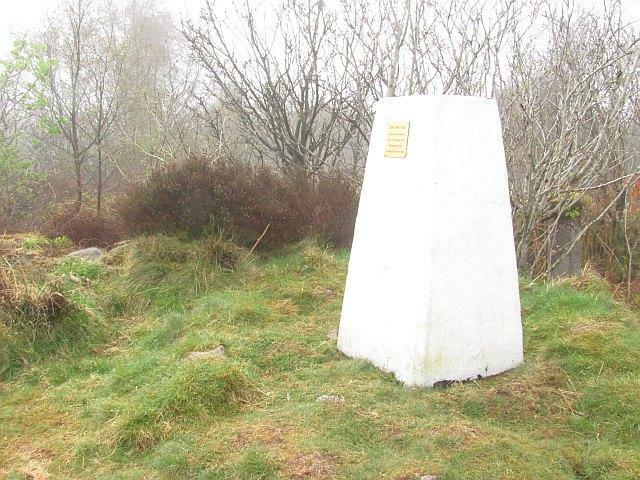 I am not sure where the northern path starts. Summit now a wild bit of woodland and very attractive. 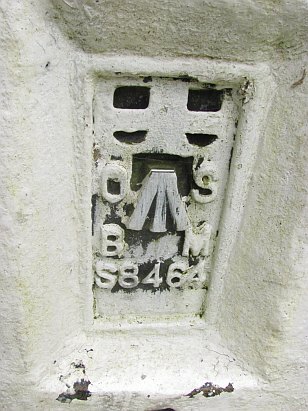 Pillar is missing plug but is also freshly painted white. 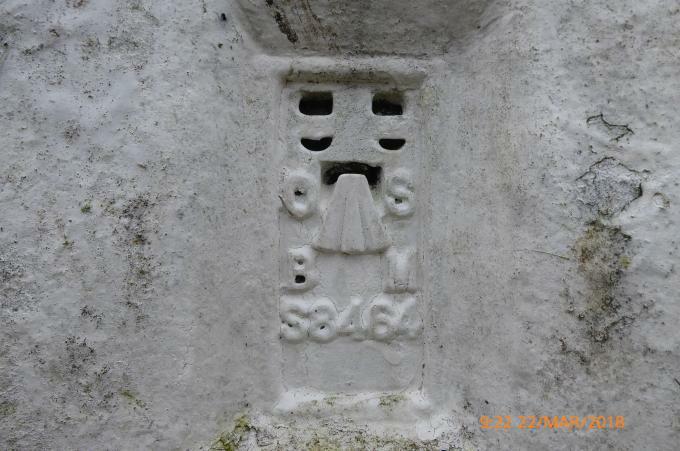 HISTORY: Pillar completed 24th August 1955 costing �48.5s.11d. 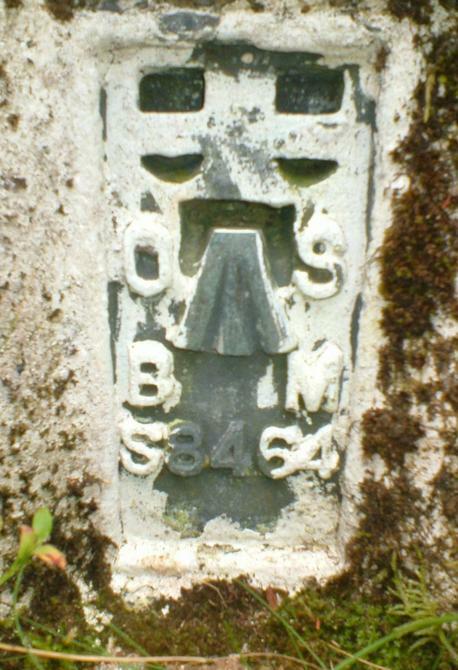 Computed using distomat survey methods to tertiary triangulation standards as station NX56/DM/T31 during 1958. Levelled for height to Class 1 precision, tertiary standards in 1972. 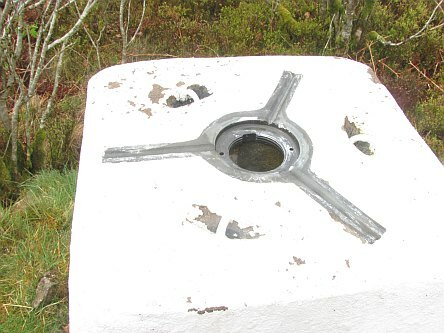 Last maintained by the OS in June 1988. 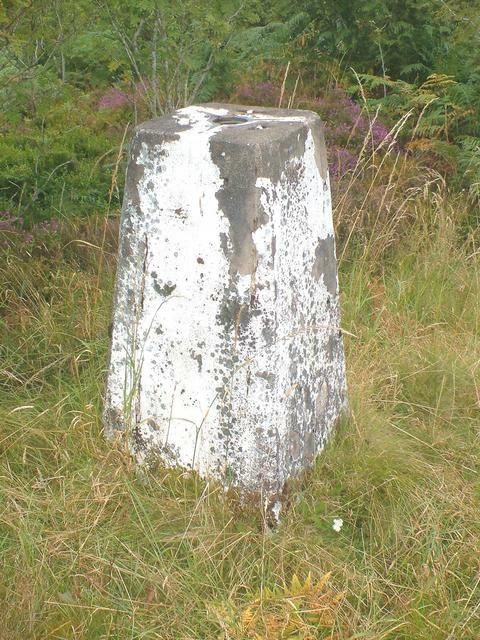 SITE VISIT: Pillar in good condition and recently repainted at date of visit. Spider centre open. 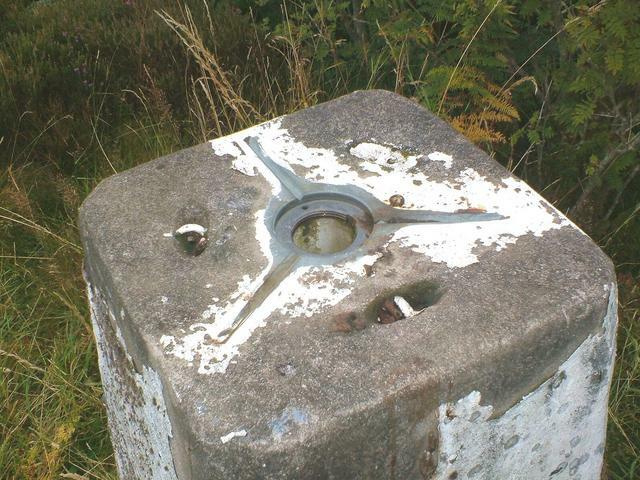 Flush bracket faces northwest, compass measurement 302�. Vented through NW and SW sight holes. 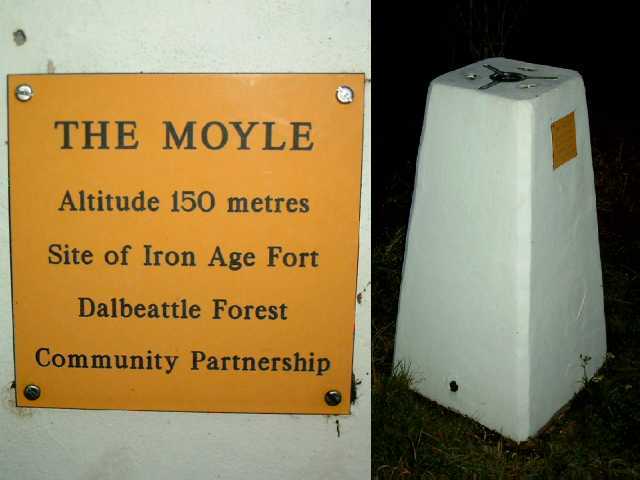 S8464 - Moyle Hill & GRP after dusk. 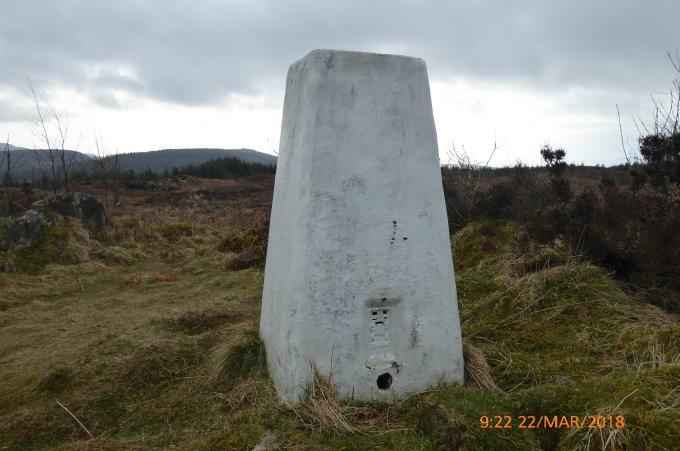 vgc, no cap or plug, nice heathery summit, scattered trees, fine view. 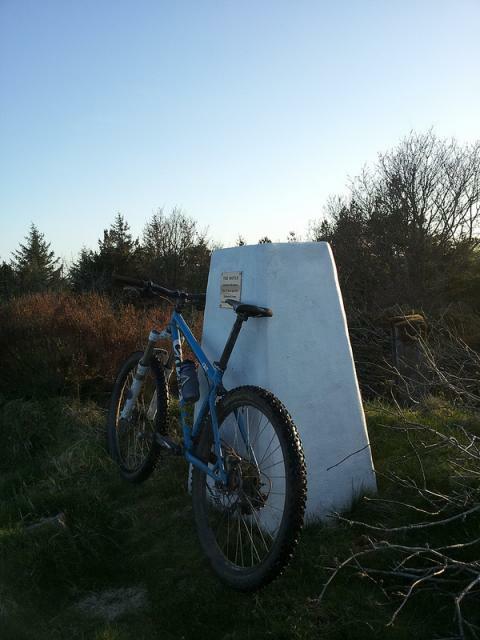 Mountain bike passes just W of trig, providing easy public access. Slightly tricky to access this one through shrubbery and dense foliage. There may be a better way but I approached from Kippford up a forest track from Barnbarroch then joined a Forestry Commission MTB singletrack called Moyle Magic, up a short steep climb then followed it north eventually running alongside an old broken down wall until it began to descend then struck out east uphill to the northen end of the summit. The area is overgrown and views are obscured. 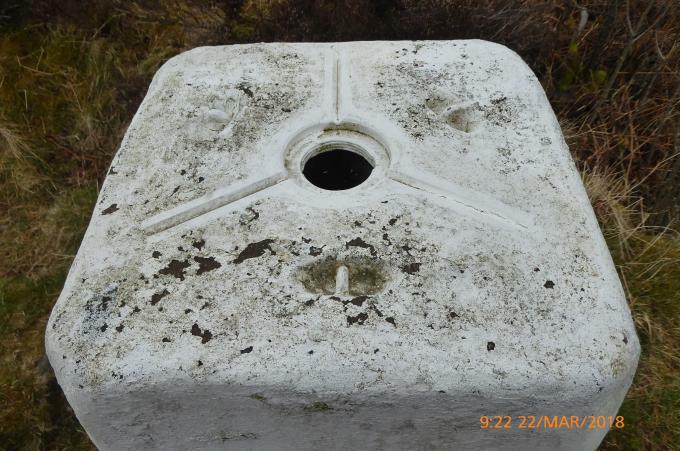 There are a couple of small concrete pillars nearby possibly there has been a mast or aerial here in the past. I have logged it as good although the plug in the middle of the spider is missing. 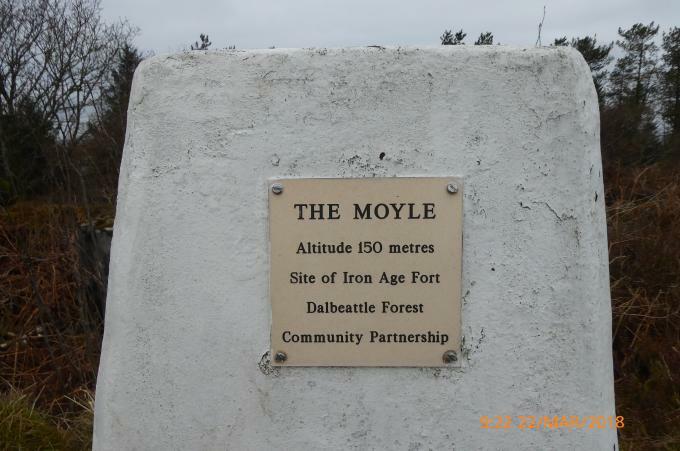 Moyle Hill Trig is well hidden in trees. 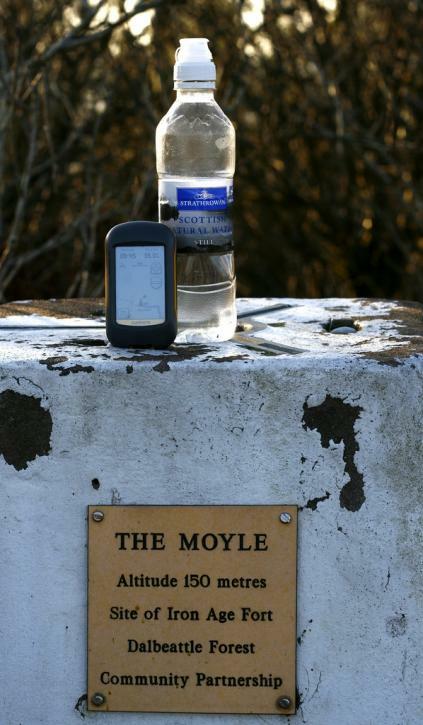 Moyle Hill Close up of trig. 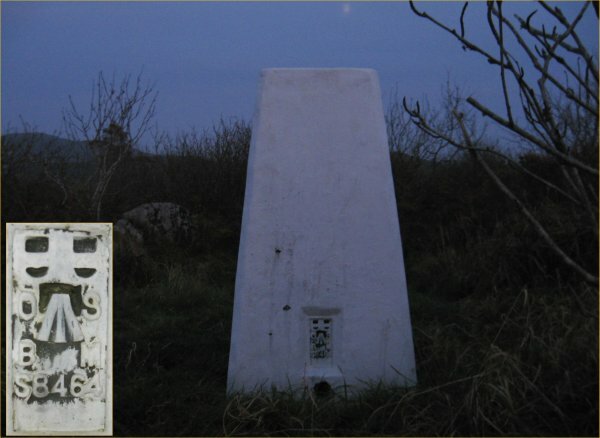 Moyle Hill Top or trig showing missing plug. Moyle Hill Looking towards the Galloway Hills. 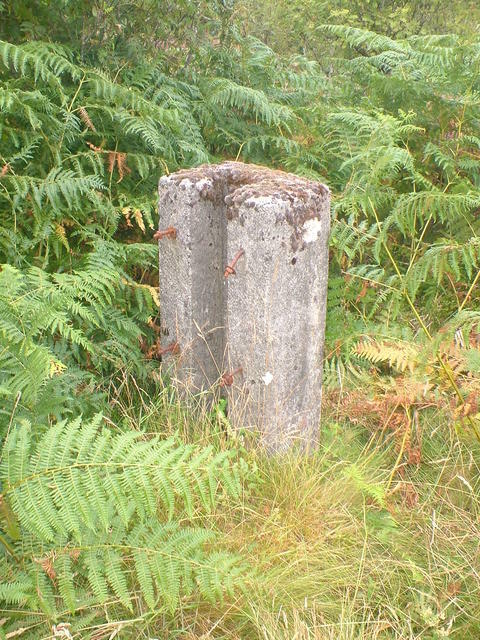 Moyle Hill One of at least two concrete posts near trig. 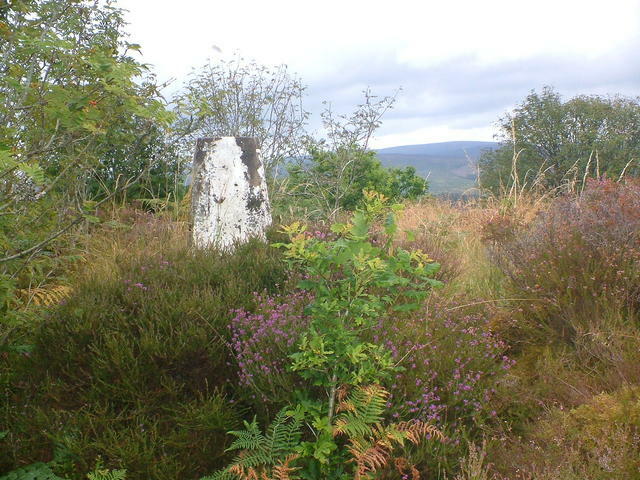 Moyle Hill Looking in direction of trig from singletrack.